From the Zoya Reverie collection, I decided to wear Reece out tonight. Zoya calls this color "gilded rose metallic" but I'm calling it purple mauve with a yellow orange shimmer. Again, I have NO SUN, so you really can't see the beautiful duochrome that this is. Here's a badly focused indoor picture so you can see the yellow orange shimmer. I must admit, getting used to the Zoya brush takes a bit. It's shorter than China Glaze but that also leaves less room for pooling in the cuticles. I had to go back and paint just the sides of my nails since I missed those the first few times. I probably could have gotten away with one coat with just a bit of VNL, but I went for two coats over Seche Natural and topped off with one coat of Seche Vite. One "sun" picture - you can see a bit of the shimmer. And one icky inside picture so you can really see the duochrome (!). 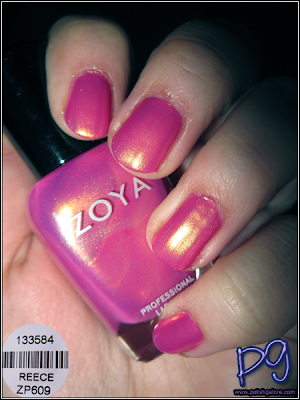 Zoya [official website] can be purchased on their website. That is a beautiful color, it kind of reminds me of CG Strawberry Fields. 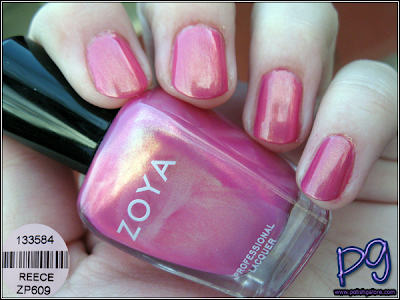 Gorgeous, it's like a lighter version of Zoya Persiphony! I'm not usually a pink lover, but this one has something that makes me go "oooh, pretty!". This is really pretty! I like the name too. It's actually way more purple than pink... Strawberry Fields is a pink base. I'm hoping for some sun soon so I can do a comparison. This is so pretty, this is a pink I can get behind, duochrome goodness!! Wait, I nominated you for the Best Blog Award. Apparently, I am not along!! ha ha! I nominated you too!! I thought you hadn't been nominated yet since you hadn't posted anything in reference to it, lol, but I know you've been super busy with your new job...hope its going well! :) Love this color on you, BTW, its one of my fav from this collection!